Snow sculpture at Kemi. All photos by Frances Thompson. Was it all a winter wonderland dream? A castle made of snow melts into the sea to make room for spring. A story from reader and blogger Frankie Thompson. KEMI, Finland – The approach to SnowCastle is a long, straight road from Kemi's town center that leads straight to the sea. In January, when I was there, it was a channel for an ice-cold breeze, lined in thick, white snow. The unaccommodating climate does little to deter the locals who go about their business on bike and by foot. I was going about my own business, towards the castle, a seasonal attraction for three months of the year, and a masterpiece in progress for the remaining nine. I was with my boyfriend, a stubborn sightseer who distains anything remotely touristy, nevermind an attraction with a Guinness World Record. I managed to squeeze it into our plans after two weeks of snowboarding in Finnish Lapland. Kemi is an ideal location because of the views of the ice-covered Gulf of Bothnia between Sweden and Finland. 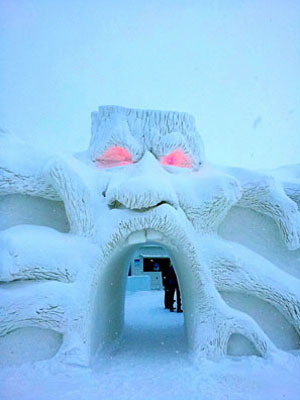 To reach it, we walked under a menacing looking arched snow sculpture and towards 5,000 square meters of sculpted ice. "This is so cool," he said. 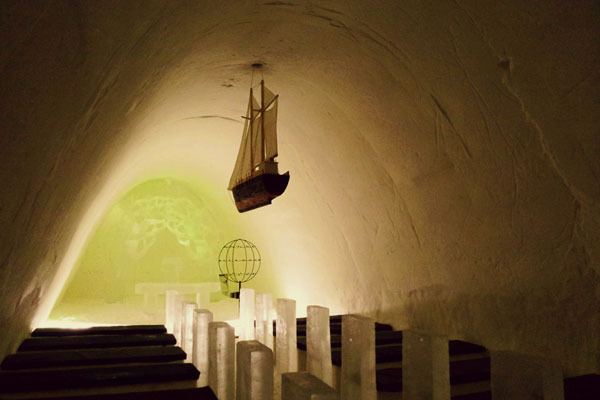 Wide-eyed, we went inside a SnowChapel. 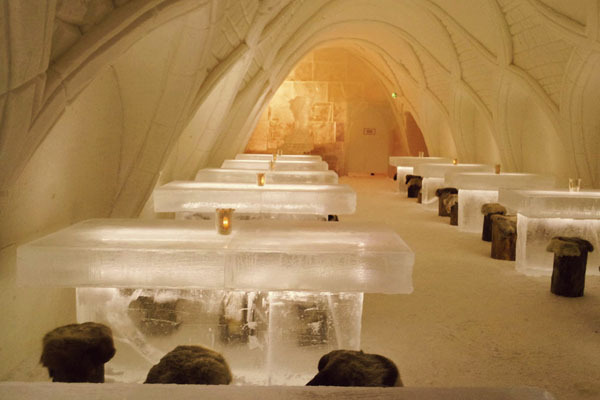 It had an arched snow roof and rows of ice benches, just as you would expect. It was illuminated with green lights and had an old model ship hanging from the ceiling — just a few of the unconventional, magic touches that we soon found everywhere. We were told that weddings and baptisms were held here over the winter. I could see how the fleeting nature of the structure made it very romantic. 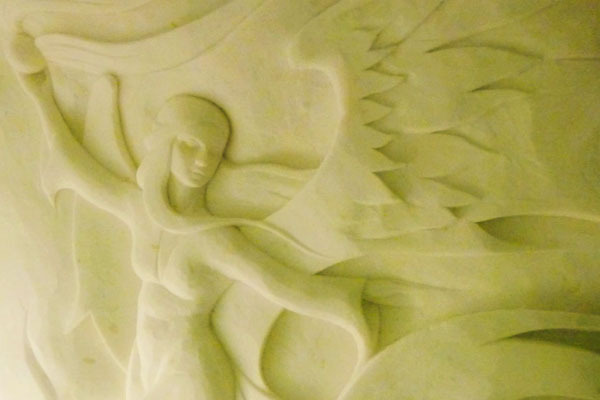 Elsewhere on the tour, striking ice statues inspired by fairytales were hand-carved into building structures. There was a Mad Hatter, Beauty and the Beast, and a room full of Angry Birds, a nod to Finland's most famous export since Nokia. There were also technical details: We learned ice was made from water lifted from the nearby Baltic Sea; large-scale pressure moulds were used to make packed snow walls and domed roofs; over 2000 lorry loads of snow were needed for the building of the chapel, restaurant, and hotel. That's right. For the full experience, book one of 40 beds in any of the SnowHotel's double rooms, family rooms, or honeymoon suite and prepare to spend the night in what is effectively, at 24 degrees Fahrenheit, a freezer. Extra warm gear is provided, along with a sauna and breakfast at a nearby (heated) hotel the next morning. We did not want to stay the night. But we did want to try out the rubber ring snow slide before climbing to the top of the tower to look out across the frozen sea. 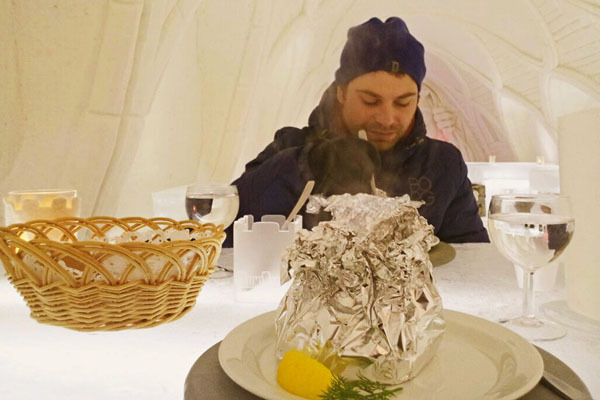 Afterward, perched on ice stools covered in soft reindeer skins, we dined on a three-course meal of creamy salmon and mushroom soup, tender cuts of reindeer, and piping hot blueberry crumble at SnowRestaurant. It turned out to be one of our best meals of the trip. One of the strangest things about leaving the SnowCastle was feeling the temperature rise considerably as we walked outside. Certainly not a normal feeling to have in the middle of January, just south of the Arctic Circle . It was almost, just almost, like a glimpse of spring. Frankie is a Londoner, travel writer, blogger, and author of short stories currently living a nomadic lifestyle with her Australian boyfriend and too many vintage dresses. 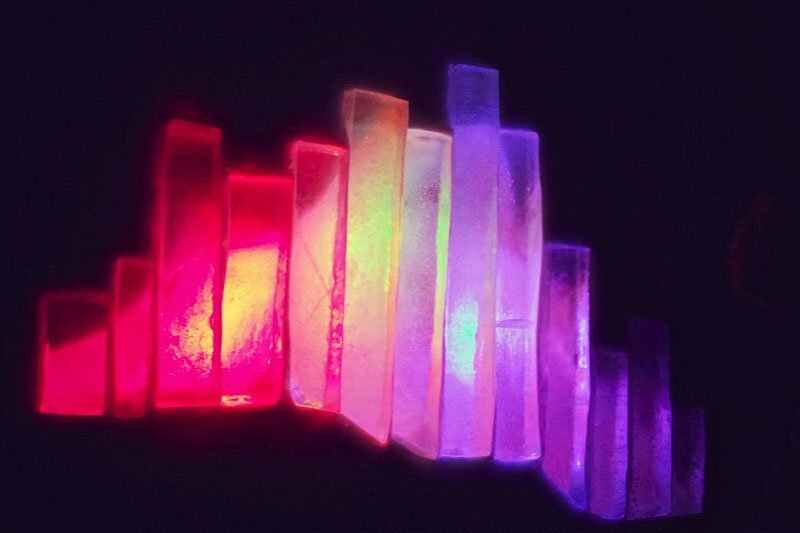 She travels for the colorful, crazy, and cool stories she'll tell her grandchildren.